Rockhounds Find Dinosaur -- In A City! There are everyday miracles and wonders all around us much of the time. There are wonders to be found even in cities where the marks of feet trampling the ground tend to hide anything unique. In some cities it seems that everything is the colour and shape of footprints! There are a couple of ways I try to see everyday wonders underfoot -- one way is by being a rockhound. Rockhounds are people who do a very informal kind of citizen science. They collect rocks and learn about many kinds of stone. Here's a link to a pamphlet on rockhounding from the Geological Survey Branch of the British Columbia Ministry of Energy and Mines. I love to poke around at loose stones and also big rocks that stick up through the ground. Everywhere I go, I try to scrabble up hills and down gullies to find local rocks. There are often park trails to follow, but if all I have time to do is walk in a playground or along a beach, I do it. There's always a pebble or two in my pockets when I go home, except in places like Dinosaur Provincial Park where visitors are asked not to take away rocks that they find. 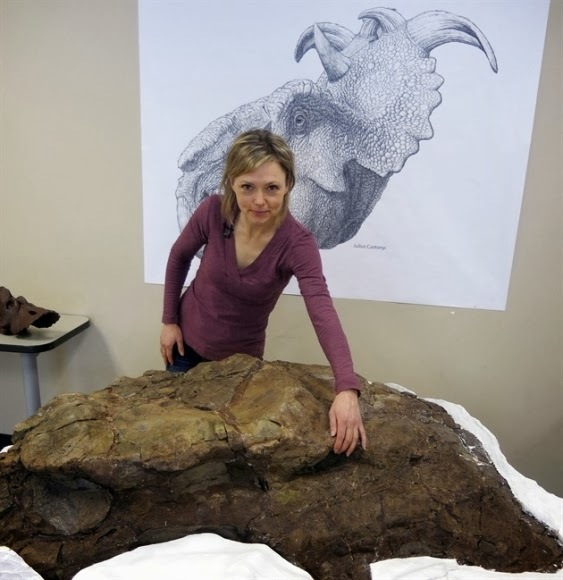 Bill Graveland took this photo of paleontologist Darla Zelenitsky as she pointed out the eye socket of a pachyrhinosaur skull found in the town of Drumheller, AB. Now I'm reminded that scientists from universities are rockhounds too, and they are finding everyday miracles and wonders in unexpected places. Take Drumheller, Alberta, for example. This small city was the end point for my kayaking trip on the Red Deer River. I've walked through much of Drumheller on a few visits to the Royal Tyrrell Museum, and can report that there's a layer of amber-coloured dust over almost everything in town. The marks of footprints are everywhere that isn't paved. And in one well-trampled part of town, what looked like a bumpy rock turned out to be a dinosaur skull when some rockhounds took a closer look. To be fair, after 60 million years in the ground it was also a bumpy rock. The skull had been preserved in rock as a fossil. How many dinosaur fossil fans have stepped on this big ol' fossil in recent years since the museum and rockhound stores were opened? No one knows. I figure this dinosaur skull is a lesson to be aware of wonders and miracles underfoot and all around us. Instead of dividing the world into "Exciting Places" and "Oh Well -- Dull Old Home" I'm going to practise my rockhound skills at home as well as in distant places. 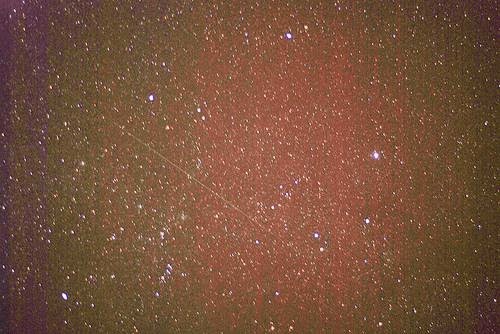 A brand new meteor shower occurred in the early morning hours Friday May 23 to Saturday May 24 called the Camelopardalids. A meteor shower happens when particles from space -- meteors -- pass into the Earth's atmosphere at the same time, or when the Earth passes through a debris trail left behind by a comet. Some people call them "shooting stars." There are several meteor showers every year, like the Perseids pictured here. This meteor shower is predicted to occur again in August. Another meteor shower expected to occur on October 21 this year is the Orionids. These small chunks of ice, rock, and minerals were left behind by Haley's Comet. We'll see them again on October 21 this year, according to predictions. Other meteor showers occur regularly, and some can be predicted at certain times of the year. For example, the Lyrids are formed by debris from Comet Thatcher and can be seen in late April. The intensity or brightness and length of meteor showers vary. Websites like Spacedex offer a list of meteor shower predictions to help flag these dates. 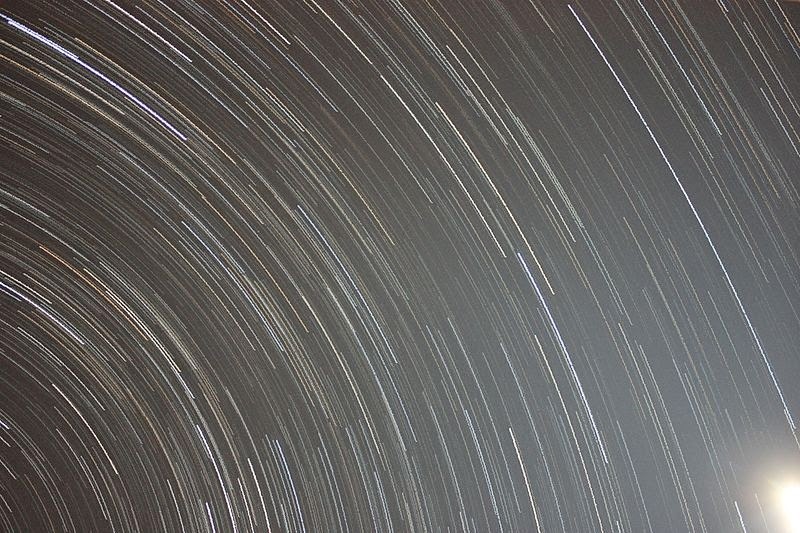 Scientists had predicted the new Camelopardalids meteor shower on May 23-24 would be as strong as the Perseids. The radiant or the point from which it radiates is large, so scientists anticipated it would be a strong and bright meteor shower. It's caused by debris from comet 209P/LINEAR located between the constellations of Ursa Major and Cassiopeia, and it's named after the constellation Camelopardalis (the giraffe). Because it had never been seen before, it was difficult to predict exactly when it would appear or how bright it would be, but NASA set up a live feed to view the shower.